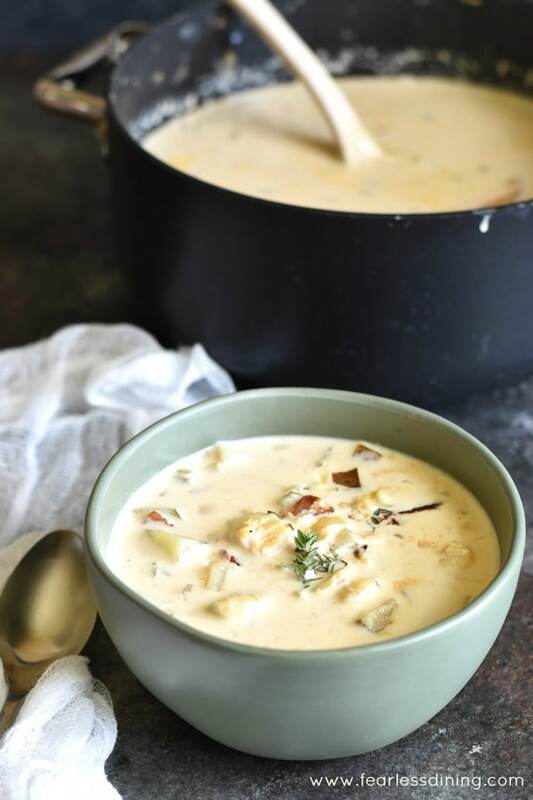 This creamy fish chowder recipe is special because it is roux free! It isn’t often you can have a gluten free New England style chowder. And a special bonus, this soup is also lactose free! 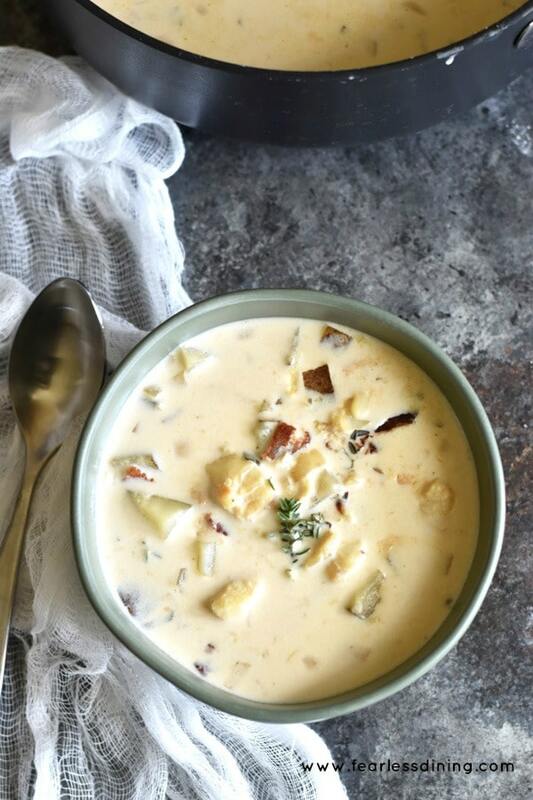 Grab a spoon and appetite because you are going to want seconds of this delicious fish chowder. I also include a video below so you can watch every step of making this easy chowder recipe! 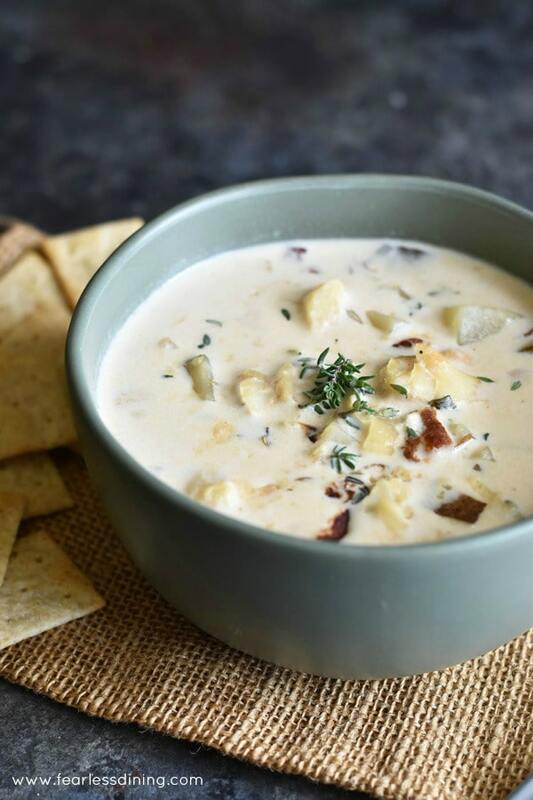 When is the last time you had chowder? 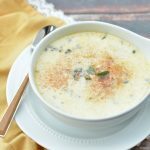 Our family loved eating chowder before going gluten free. When I say loved, chowder was the best form of comfort food for my son. My son went into mourning when he could no longer eat his favorite soup. When I made this fish chowder, I texted him a picture of it cooking so he knew he would have a treat when he got home. He came home hungry, two bowls of this soup devoured…he seems to be in a perpetual growing phase. Most New England style chowders are made with a roux. Roux is a flour paste, made out of wheat flour. This paste is used to thicken the chowder. 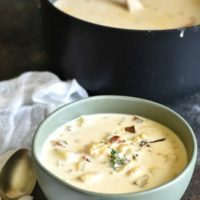 I am really excited to share this recipe with you because it is completely possible to get that amazing creamy clam chowder flavor without lactose and without gluten! 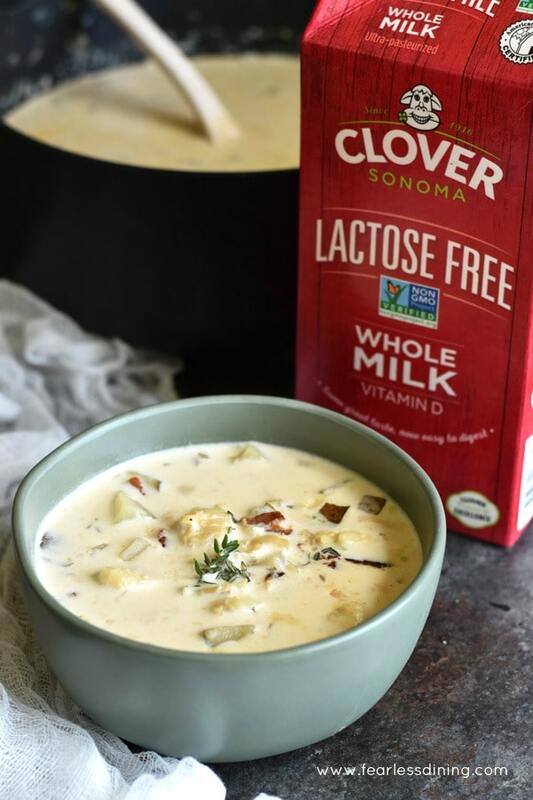 One of the reasons I am making this soup for my family is because I can now make it lactose-free with Clover Sonoma’s new Lactose Free milk. Their lactose free milk comes in nonfat, low fat, reduced fat, and whole milk so there is an option for everyone. Our family doesn’t react well to lactose, so this milk is perfect so we don’t feel bloated. I have been buying Clover milk for years. For those of you who have been reading my blog for awhile, you know how much I love companies that give back. Both to their community, and the environment. Clover is newly certified as a B Corporation (B Corporations are leaders of the global movement of people using business as a force for good TM). I love that Clover has the forward-thinking vision of making sure our planet is taken care of for future generations. Clover has remained conscious and careful about what goes into their products (and what doesn’t) for three generations. This means you can feel good about serving Clover Sonoma’s milk to your family! Clover has had a sustained commitment to natural dairy products including non-GMO and organic lines sourced from small, local farms. They have the highest standards of verified social and environmental performance, transparency, and accountability, and has the highest standards in the dairy industry. Clover’s milk comes from 29 small family farms in Northern California, primarily in Marin and Sonoma counties. (This is up in the beautiful North Bay Area, where we love to hike and spend a lot of time.) Clover ensures that the dairy farms they work with meet their standards of quality (bacteria, coliform, and somatic cell counts), animal welfare and environmental stewardship standards. Did you know that Clover was the very first dairy in the U.S. to become American Humane Certified for the humane treatment of cows? 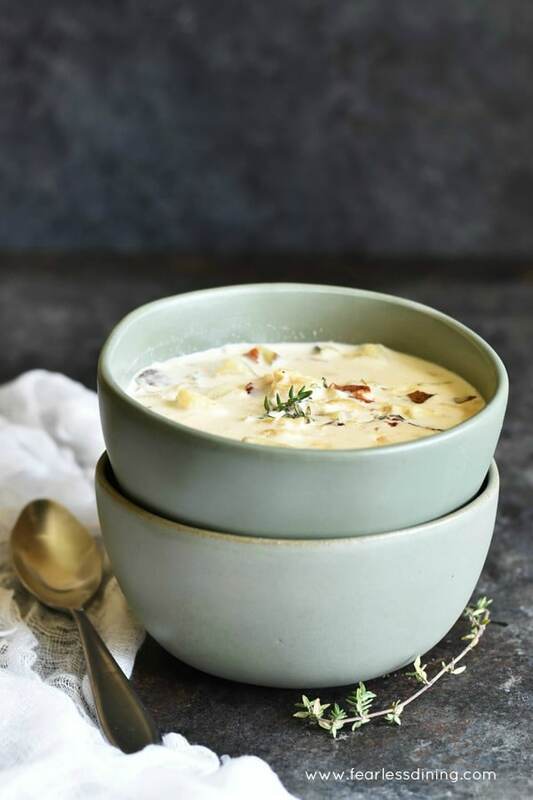 Are you ready to make this creamy cod chowder? Grab Clover Sonoma’s Lactose-Free’s Whole Milk in the red container at your local grocery store. Change the seafood from Cod to clams, shrimp, or any of your favorite fish. Mix it up by using sweet potatoes instead of regular potatoes. 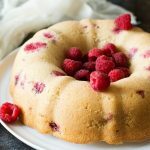 This will add a little more sweetness, which would taste great with the fresh sage! 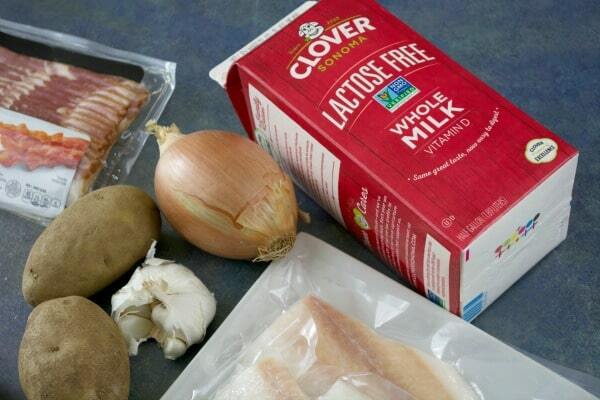 A simple, creamy lactose free and gluten free New England style fish chowder recipe. In a skillet, add oil and onion. Sauté until the onions begin to turn translucent. Add potatoes and cooked bacon. Mix well. Add seasonings and cornstarch and cook for 10 minutes. Cover and bring to a boil, on medium heat and allow to gently boil for 10 minutes. Turn temperature to simmer and allow to cook another 20 minutes until done. I love this! It’s so important to create classics that people with dietary restrictions can enjoy. 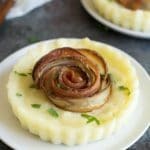 I avoided clam chowder for a long time after going pescetarian because of the bacon, but recently came up with a pescetarian-friendly recipe that uses smoked kipper fillets instead. Same smokey and salty flavor, and still just as scrumptious! This looks fabulous. I’m sure people who can’t have gluten or lactose are singing your praises right now. I love your bacon free recipe. It would be great for those who don’t eat pork. Well this sounds like just what I have been craving! Cannot want to have a big bowl! Big chowder fans and I can’t wait to try this. It sounds fantatic. 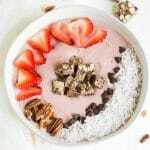 We try to avoid gluten as much as possible and this sounds perfect! This is genius! So many people have a sensitivity to gluten and/or lactose, and now they can enjoy clam chowder too. I never would have noticed anything different if you didn’t mention it. Thank you so much Andrea…I can’t tell you how much we missed chowder. I haven’t had chowder since I was in Maine about 12 years ago. 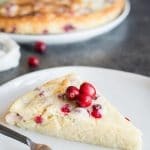 This recipe has me craving it now. Wow, I feel honored that you get to try this. 12 years is a long time! This is perfect for Lent! 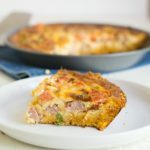 The layers of flavor are incredible! I am really glad to have found this lactose free whole milk too Joyce :-). In the recipe, it says “5 slices cooked, chopped”. What is it? Hi Dawn, you would chop up 5 slices of cooked bacon. I hope that clarifies.